Posted on Thursday, July 15, 2010, by Eric - TV Geek Army "Revered Leader"
Quick Take: Chasing Mummies, "Stuck"
Is this The History Channel's version of The Hills? (S0101) It's clear from the jump that this purported documentary series is in fact a reality series in the tradition of Bravo's Flipping Out. 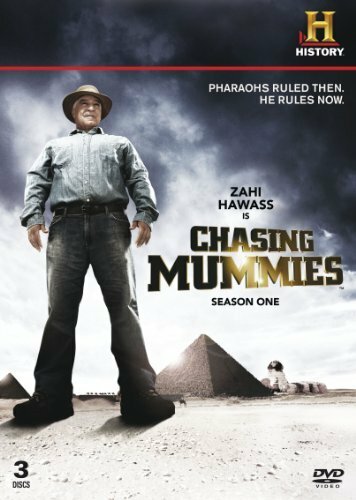 Like egomaniacal but essentially harmless blowhard Jeff Lewis, Zahi Hawass – self-proclaimed Pharaoh and "legendary Egyptologist" – is set up to be the comically abusive centerpiece of the show. "Listen to me, I am not an easy guy," Hawass tells Lindsay Tanner, an Architectural Fellow. "If you are going to come and to be late like this, you're never going to work for me. At all." House flipper Lewis couldn't have said it better himself! There's a concept in storytelling called "in media res," where you start out in the middle of the action to engage the audience, then you circle back to fill in the gaps and background. To kick things off, Chasing Mummies plops us in the middle of some crisis-like situation where it seems a crew member is stuck in a pyramid, and a chaotic several minutes follows that looks like it could have been out of a bad Nicholas Cage-helmed globetrotting adventure. We're then told it's "7 hours earlier" and we find ourselves with Hawass leading a restoration of the Step Pyramid in Egypt. Then things get a little bit weirder. An intern shows up named Zoe, who is not the right intern (she's a Canadian from McGill University, when the person on the paperwork is supposed to be on route from France). The thing is though that she doesn't look or feel like an intern. She looks like an actress trying to look and feel like an intern on a documentary / reality show. I found myself thinking, "Is this The History Channels' version of The Hills? Like The Pyramid Hills or something?" Zoe (conveniently?) turns out to be the person stuck in a tunnel beneath the pyramid later, and everyone scrambles to try to get her out. The handheld camera work here is laughably shaky and rattly and ever changing focus, as though someone told a professional crew, "Make this look like the Blair Witch Project." I can't help but think that this entire sequence was staged with the idea of, "Let's show them the very real dangers of chasing mummies and archaeology, right from the show pilot!" If Zoe's not an actress and this show not severely engineered / scripted, I'd both be surprised and deeply curious about how the hell Chasing Mummies could look this level of manipulated and artificial. We also have executive producer Leslie Greif on screen a lot as the "deal" with the show is that the crew is supposed to be part of the story (why? "Because you don't question the Pharaoh"). That said, things do calm down during the second half of the hour, with Hawass and team razing homes (the residents have been moved to "good land," we're told) built on top of an ancient burial ground (not a Pet Cemetery, Stephen King fans). Our heroes discover an unmolested tomb and unopened sarcophagus, both apparently rare finds in modern Egypt, what with all the grave and tomb robbing that has gone on over the centuries. Whether or not this sequence was staged in some way we have no way of knowing, but it was interesting to get some real historical facts here, such as that the art of mummifying was already in decline during the Greco-Roman period, where this particular mummy dates from (approximately 500 BC). There's also a discovery of a piece of an ancient and beautiful funerary mask earlier in the episode, but because I'm on my guard due to the level of heavy scripting and manipulation, it's hard to feel the oohs and ahhs of discovery that one might if this was a real documentary about ancient Egyptian tombs and mummies. Zahi is supervising the restoration of the Step Pyramid, the oldest pyramid in Egypt. It's there that we meet the new members of his fellowship program: Late to show up, Lindsay nearly loses her job before it actually begins! Meanwhile, Fellowship Coordinator Dr. Allan Morton realizes the erroneous assignment of Zoe to the program. Allan gets an earful from Zahi for his mistake before Zoe begs him for the chance to go inside the Step Pyramid for some photos...after all, she's traveled so far! Zoe goes deep inside the bowels of the pyramid with a cameraman, then gets stuck and locked inside. Zahi races back to Saqqara to open up the pyramid and save them both. From Around the Web: Chasing Mummies, "Stuck"
Baltimore Sun: The show’s website, via history.com, features a “Great Mummy Discoveries” gallery, including a look at a redhead mummy named Ginger. Perhaps the “Chasing” crew will explore whether Daywalkers roamed the Nile. Monsters and Critics: OSHA officials would have heart attacks at the working conditions that Dr. Zahi's local Egyptian grunts endure, as they bust down precarious stone walls, getting injured in the process. Thanks charles -- please check out our followup coverage. Great conversation thread going on ! I'm coming in just now to watch this show for the dirst time starting with the third episode. It's completely embarrassing. What has happened to the History Channel? That's what we're here for James, and thanks so much for dropping by and leaving your thoughts ! Hahahaha Zoe D'Amato was in a Golden Corral commercial and studied ANTRO-pology at McGill. Great job history channel! Both girls are actresses. Lindsay has an imdb page complete with previous screen and stage credits. Both have BAs in Anthro or Art History, but it's clear from their resumes where their career priorities lie. However, Hawass himself feels like the most genuine thing about this whole farce. He's like most every archaeologist I know on steroids. Exacting, egotistical, explosive: par for the course. But in Hawass' case, these qualities have run unchecked for years. In Hawass' position, being a taskmaster with a knack for plain speaking can only stand you in good stead. And with all the (obviously scripted) idiocy he's contending with on this show, temper flare-ups are inevitable. If students as dumb as those portrayed had shown up to any project I've worked on, they'd have been sent home the first week- that's if they didn't just get killed doing/saying something stupid. Seriously though, Hawass' efforts at repatriating artifacts have earned him my undying respect, regardless of this disaster. After viewing one episode of this travesty, I may have to move to a "good land," or at least a sanitarium. But I'll be checking out the next episode, not just for the big time laffs, but on the off chance that Dr. Hawass might actually apoligize for his inane antisemitic statements about the Jews controlling the world. It's interesting, Xwendekar, that the actresses seem to have some vague background in the subject area. Some thin veil to the staging, perhaps ? Mike C., I haven't seen/heard Dr. Hawass' views on this stuff but have heard a few people mention them already. 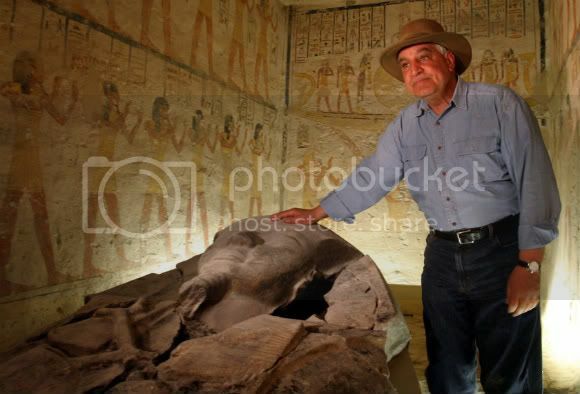 I had alot of respect for Dr Hawass until now i am no archaeologist, but i know you dont treat and handle artifacts in the manner they were doing. I would give my eye teeth to be involved in a dig site. It wasn`t a documentary it was a poorly acted mockumentary. If Dr Hawass spoke to me like that i would let him know in no uncertain terms to treat people with the respect that he himself expects. I bet he doesn`t speak to Dr Salima Ikram in this manner! And as for Zoe i would like to stone her to death and entomb her for piss poor acting, stupid questions and lack of knowledge about the Egyptian culture.